The Prime Minister, Shri Narendra Modi releasing the book "Vande Bharatam", written by Pt. Prabodh Kumar Mishra, in New Delhi on December 23, 2014. The Minister of State (Independent Charge) for Petroleum and Natural Gas, Shri Dharmendra Pradhan and Shri Bhartruhari Mehtab, Member of Parliament are also seen. 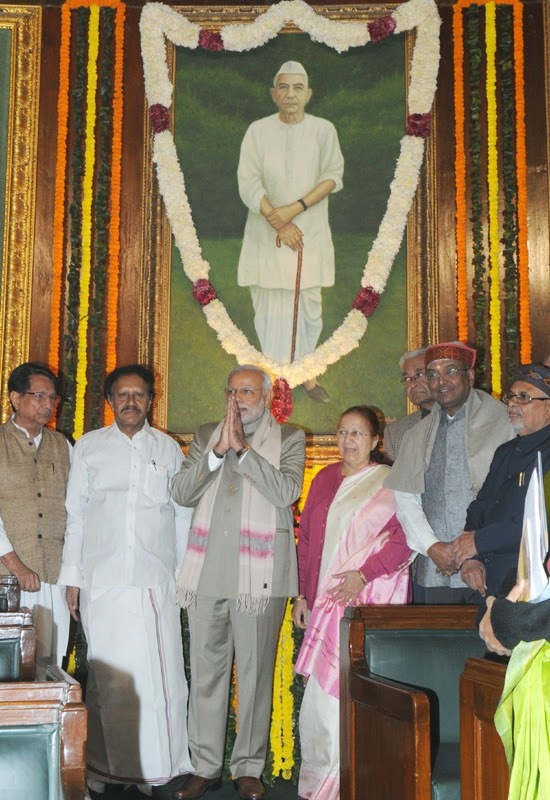 The Prime Minister, Shri Narendra Modi, the Speaker, Lok Sabha, Smt. Sumitra Mahajan, and other dignitaries paid tributes at the portrait of the former Prime Minister, Late Ch. Charan Singh on his 112th birth anniversary, at Parliament House, in New Delhi on December 23, 2014. The Prime Mnister, Shri Narendra Modi, today released the book "Vande Bharatam", written by Pandit Prabodh Kumar Mishra. The book is an anthology of Nationalistic Poems in Sanskrit, which were published in different newspapers of Odisha on various occasions. 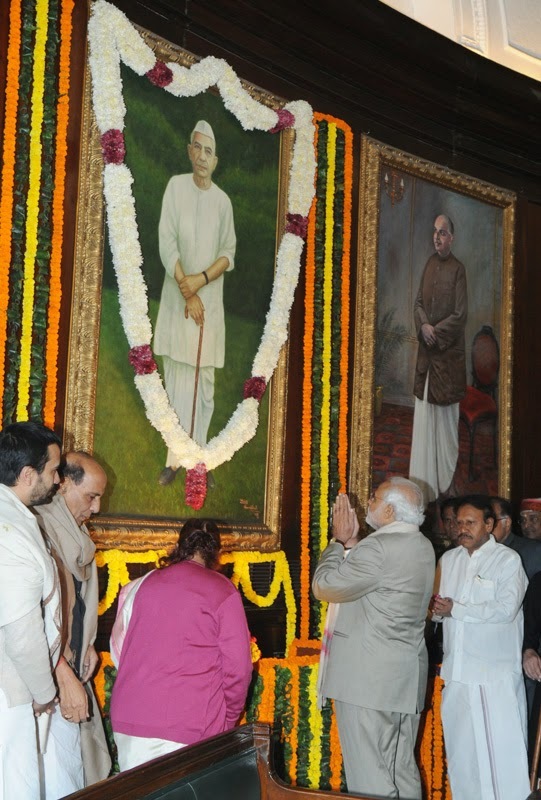 The Prime Minister, Shri Narendra Modi paying homage at the portrait of the former Prime Minister, Late Ch. Charan Singh on his 112th birth anniversary, at Parliament House, in New Delhi on December 23, 2014. The Union Home Minister, Shri Rajnath Singh is also seen. Shri Dharmendra Pradhan, Minister of State (Independent Charge) for Petroleum and Natural Gas, and Shri Bhartruhari Mehtab, Member of Parliament, were also present on the occasion. The President of India, Shri Pranab Mukherjee has condoled the passing away of Shri G. Venkataswamy. In a condolence message to his son, Shri G. Vivekanand, the President has said, “I am deeply saddened to learn about the passing away of Shri G. Venkataswamy. Shri Venkataswamy was a senior Congress leader, veteran Parliamentarian and an able administrator who served the nation in different capacities. He served with distinction as a member of the Union Council of Ministers. In his death, we have lost an eminent leader who always worked for the upliftment of the underprivileged and marginalized sections of society. Please convey my heartfelt condolences to the members of the bereaved family and Shri Venkataswamy’s countless friends and well-wishers. I pray to the Almighty to give you and your family the strength and courage to bear this irreparable loss”. The Prime Minister, Shri Narendra Modi, has condemned the killing of innocent people in Sonitpur and Kokrajhar in Assam. "Killing of innocent people in Sonitpur and Kokrajhar is an act of cowardice. Our thoughts and prayers are with the families of the deceased. I spoke to Assam CM Shri Tarun Gogoi and Home Minister Rajnath ji. Rajnath ji will travel to Assam and take stock of the situation," the Prime Minister said. The Prime Minister, Shri Narendra Modi has given birthday greetings to His Majesty, Emperor Akihito of Japan. "Birthday greetings to His Majesty Emperor Akihito of Japan.I pray for his good health. May he continue to inspire people of Japan and the world", the Prime Minister said. The Prime Minister, Shri Narendra Modi has saluted Chaudhary Charan Singh ji on his birth anniversary. "A tall mass leader who dedicated his life to the welfare of farmers and the poor, I salute Chaudhary Charan Singh ji on his birth anniversary", the Prime Minister said.